We could live off of rice, beans, and tortillas for breakfast, lunch and dinner – no problemo. Add in avocado and sour cream every once in a while and that is a diet based off a solid and tasty foundation. We didn’t have to try very hard to stick to this regime during our trip to Playa del Carmen. Our airbnb was in a fabulous location; one block from the beach to the east, and one block from 5th Avenue to the west. As such, whenever we were hungry we had to only walk a few steps in order to find something scrumptious to eat in Playa del Carmen. A lot of the places we ate at we just happened upon, but we also grabbed recommendations from friends, instagram, or the interwebz. 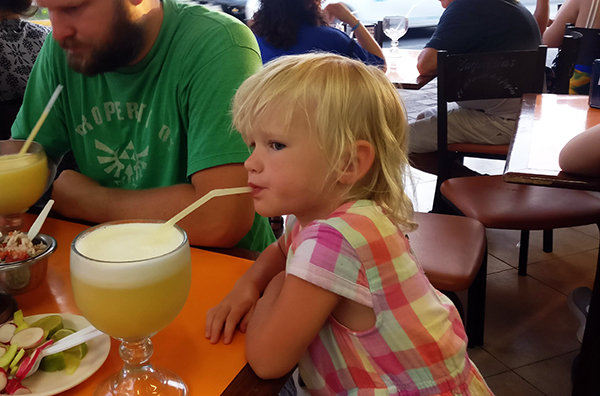 The result is our guide to all the #cleandiaper and #stinkydiaper restaurants Playa del Carmen has to offer. This list isn’t definitive, after all we were only here a week, but it’s a starting point to help you run towards or away from some of our favorite, and not favorite, restaurants. 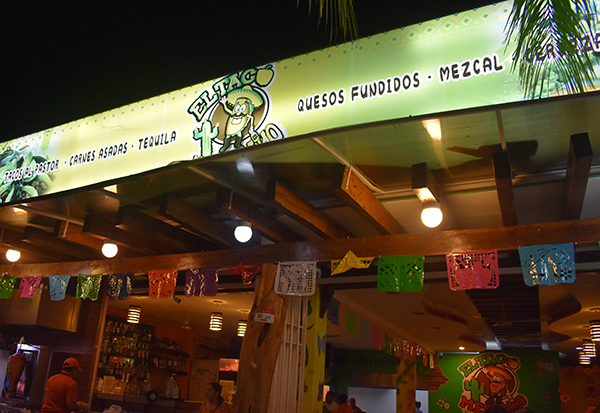 El Taco Mexicano earns the high praise of our #1 favorite place to eat in Playa del Carmen. Gabriel came here on our arrival night when the kids and I were too tired to leave the airbnb and trusted him to bring back something amazing. He didn’t disappoint. He came home bearing gifts of sizzling chicken, pork and beef with grilled onions, and peppers, and guacamole with bean soup and stacks of tortillas. Everything was seasoned and cooked to perfection. We came back to the restaurant as a family the night before we departed and it was even better in the restaurant. 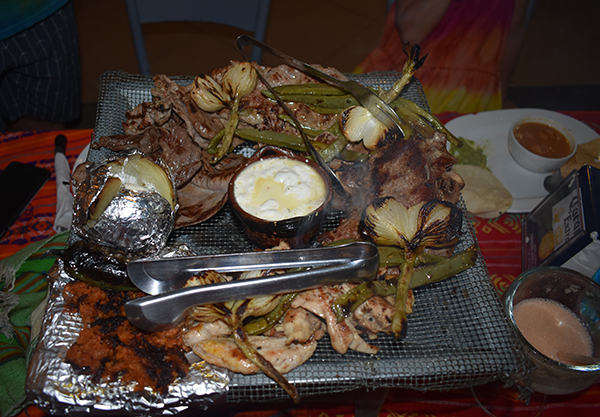 We were treated to an authentic Mexican BBQ family platter and devoured every last mouthwatering bite. Recommended by @4_for_travel on Instagram, we tried out El Fogon after a series of disappointing #stinkydiaper restaurants. 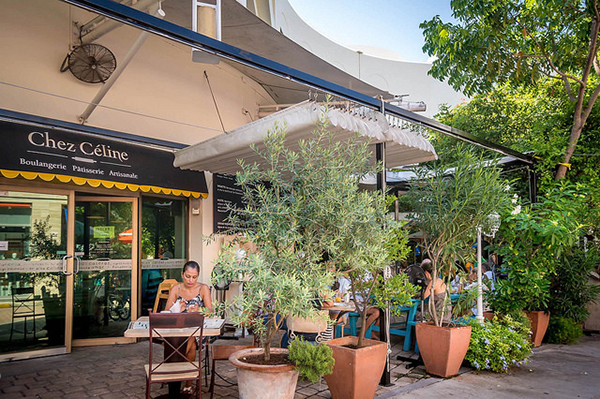 This incredible restaurant earns our #2 spot for favorite places to eat in Playa del Carmen. We ordered steak smothered in cheese, El Pastor tacos, something with chicken, and quesadillas for the kids. The entire menu was in Spanish and our limited language skills felt like a stab in the dark. But, everything was phenomenal! 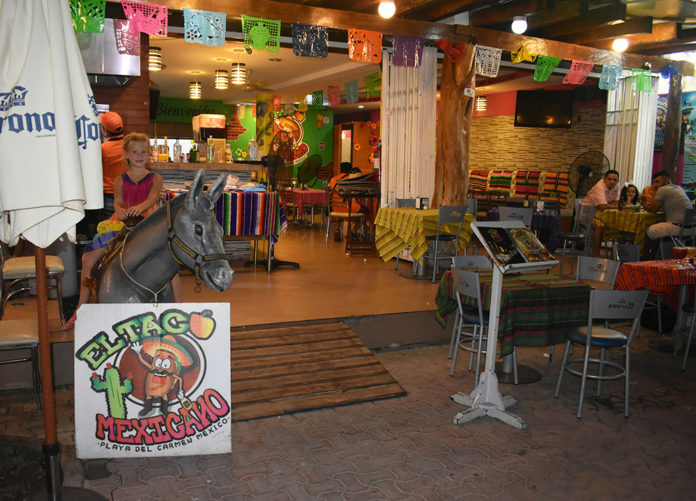 We could have eaten here alternating with El Taco Mexicano for the entire trip! We kind of wish we had. In an attempt to find a local ATM we stopped into Micaela’s Restaurant for breakfast on our first morning in Playa del Carmen. The brightly colored restaurant boasting indoor seating with A/C was too tempting to pass up. The flashy decor matched the service and the food! 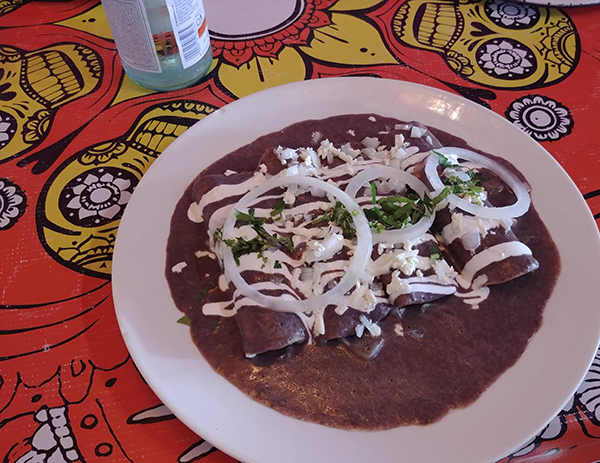 With breakfast burritos smothered in mole, a Mexican egg omelet and pancakes, plus chips that surpassed any other offering in Mexico we definitely rank Micaela’s high on our list of favorite places to eat in Playa del Carmen on 5th avenue. La Boulangerie is the complete opposite of Chez Celine (see #stinkydiaper ratings). Where Chez Celine didn’t have a large variety of croissants or tartelettes – a staple of French cuisine, La Boulangerie was brimming with different concoctions. They had eclairs, strawberry tarts, pecan tarts, apple tarts, pain du chocolat, almond croissants and more. Everything we had was delicious, and if it hadn’t been our last day in Playa del Carmen we would have come back again and again. These vendors don’t even have a name, but they are located outside of every single convenience store we came across along 5th Avenue. They aren’t that noteworthy, but in hot and humid Mexico, who is going to argue with ice cream? We really wanted to try out Tepoznieves, with flavors like fig with mezcal, cactus, and pineapple chili, but the location in Playa del Carmen was permanently closed. 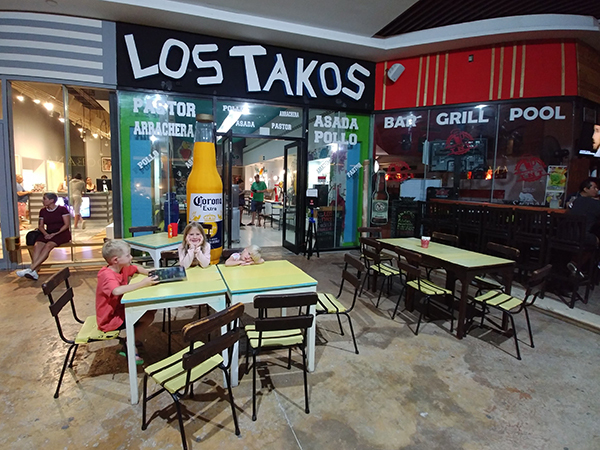 Los Takos isn’t all bad, but it wasn’t a good enough place to eat in Playa del Carmen to earn a #cleandiaper. 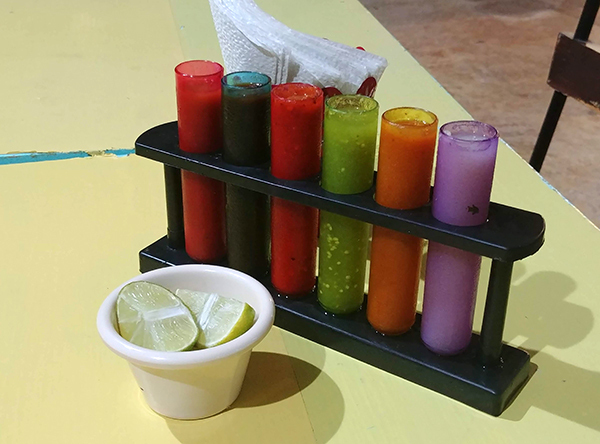 With every meal they offer test tubes of hot sauce in varying degrees of temperature which are fun to try and might be the best part of the restaurant. The tacos, though a little dry, were tasty enough. Tasty enough to make us come back and try the restaurant another tired night when we’d been out all day. The quesadillas were straight up unpalatable, and the burritos weren’t much better. 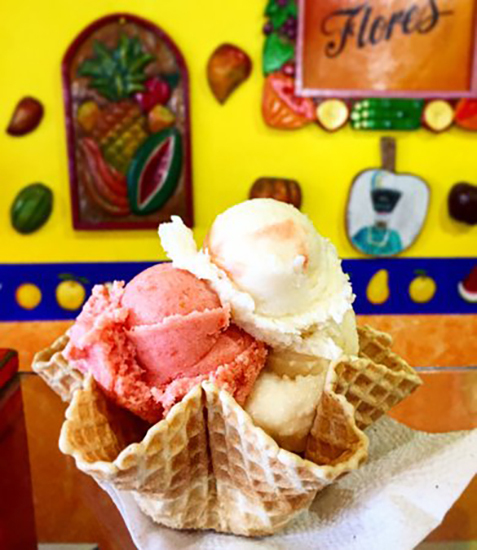 Technically not on 5th Avenue, Chac Pel is actually a few blocks down on 10 Avenida Sur. 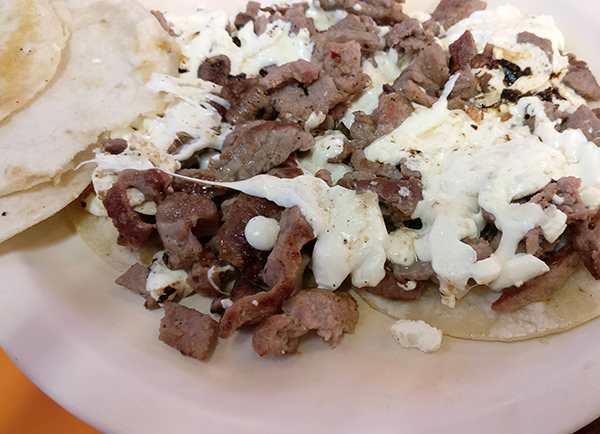 We found it on a list for The Best Damn Tacos in Playa del Carmen, so naturally we had to try it. Frankly, the title is completely undeserving. There was absolutely nothing special about anything served here. 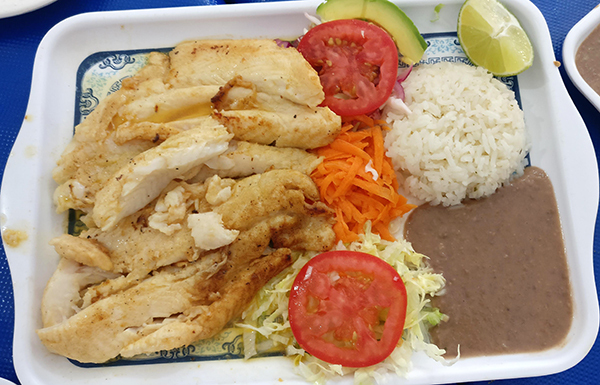 Everything did appear quite fresh, and like most restaurants in Mexico was cooked directly in front of us. We ordered traditional fried fish tacos, octopus tacos, shrimp tacos, chicken tacos, and nachos. We were hungry. The nachos sadly, were probably the best thing we ate. Everyone recommends El Pirata. Not only is it a restaurant, but it is also a fish shop. You can go next door and order your fish, then take a few steps to your table and wait for them to cook it up for you. I’m not sure why we weren’t completely enthralled when it has such rave reviews. The portions are huge, the flavors are strong, but there is nothing that remarkable about this place. The garlic butter tastes like powdered flavoring, and we found ourselves wondering why everyone is so nuts about this place. Do tourists order from a different menu than locals? Do they change the way they cook it because we clearly aren’t from Mexico? Whatever it is, we weren’t impressed, and El Pirata didn’t make the cut for our favorite place to eat in Playa del Carmen. Run as fast and as far away as you can from Burro Playero. We were tempted by the Burgerito (a hamburger in a tortilla) they advertised but nothing could have made that taste good. Chez Celine is a little french bakery and restaurant that was recommended to us by a couple we met at our local airbnb in Playa del Carmen. They loved it so much they said they ate here everyday during not only this 10 day trip, but the last two years they’ve been coming here for a week during the summer. Clearly we were not on the same page when it came to a love of rice and beans. We decided to give it a try. The menu consists of french sandwiches, quiches, baguettes, etc, but the bakery offered only a scant amount of croissants and tarts. We were underwhelmed. We ordered a few bakery items, and weren’t overly thrilled. 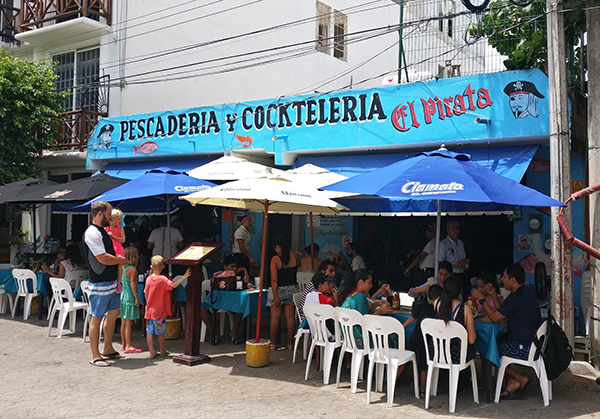 We couldn’t imagine coming here everyday to eat in Playa del Carmen. We passed by Ah Cacao every time we made our way up to 5th Avenue. It was actually our landmark for turning off 5th to head back to our airbnb. 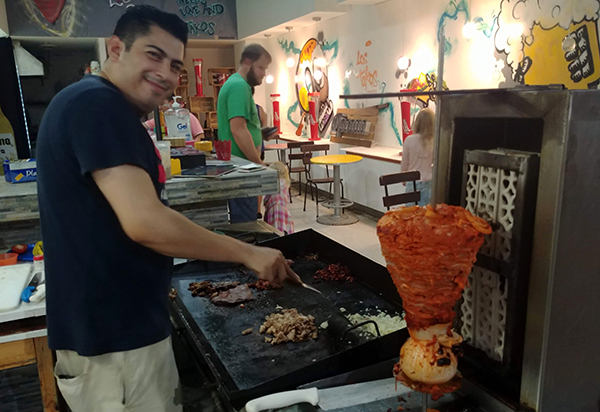 There are a ton of these little chains, so we definitely wanted to stop here to eat in Playa del Carmen. Ah Cacoa has four items for sale: corn cake, cheesecake, chocolate cake, and carrot cake. You can also get some hazelnut ice cream and a few misc other items. With the name Ah Cacao, we kind of thought the menu would be heavily influenced by Mayan chocolate desserts. Instead, it was just another bakery with a lackluster menu. 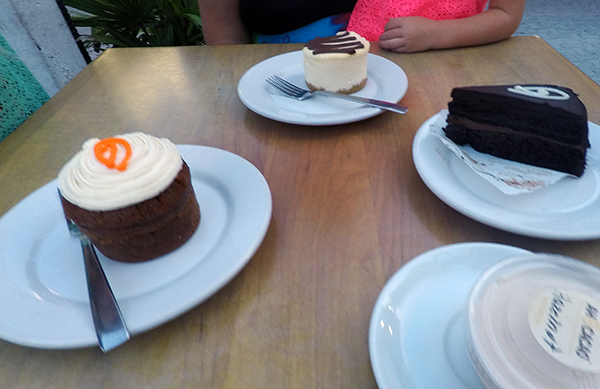 We tried everything, and really the only thing that was good was the carrot cake. In case you don’t know, carrot cake doesn’t have chocolate in it. 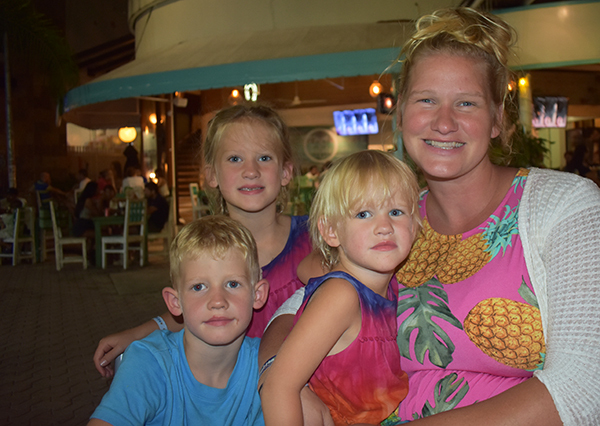 ► For Kids: We ranked our favorite and not so favorite places to eat in Playa del Carmen according to both our and our kids preferences. For example, Los Takos was decent for parents, but the quesadilla was bad news, even by our standards. 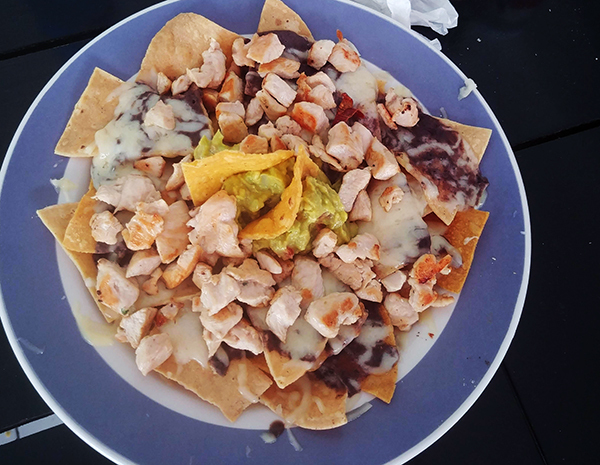 Most places offered a side of rice, beans and cheese with platters stacked high with tortillas. Everyone was happy about that. 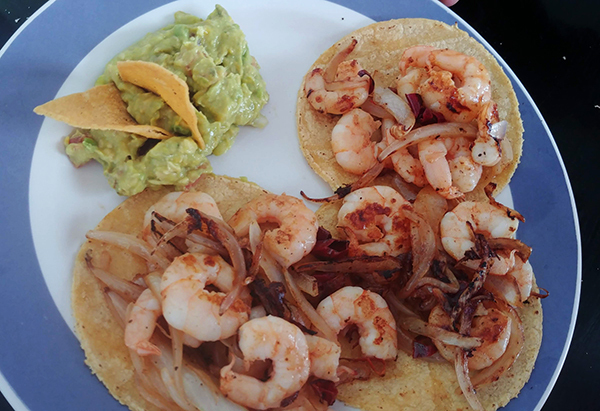 Where is your favorite place to eat in Playa del Carmen? We’d love to hear what we need to try next time we head back! ► Nap-Time Version: Our family’s guide to all the #cleandiaper and #stinkydiaper restaurants that Playa del Carmen has to offer on 5th Avenue! Check out How Not to Rent a Car in Cancun, and Driving in the Yucatan Peninsula of Mexico. 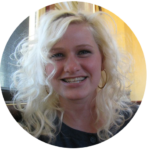 Next articleChild Trafficking at Disneyland | Are Your Kids Being Targeted?